Succulents Silicone Candy Mold by Wilton.Turn desert into dessert with this adorable succulents lolli mold and Candy Melts candy. Fill with 5.2 ounces (147 ml) of melted Candy Melts candy, then chill until firm. Place mold upside down on flat surface and push candies out from the bottom of each cavity. For a dimensional effect, brush a lighter color candy on the mold with a decorating brush. 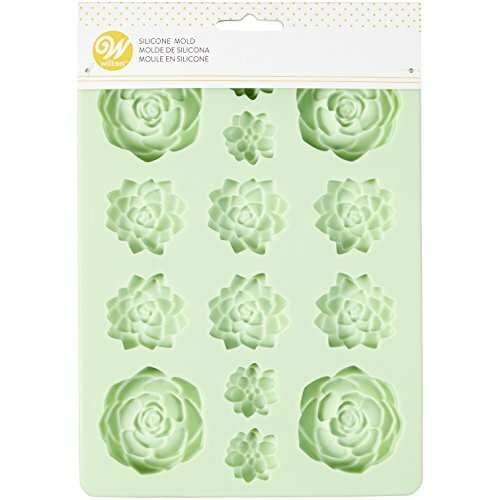 Also great with our Wilton Gummy Mixes.Silicone mold creates detailed succulent candies, perfect for gift-giving or decorating treatsMaterial: SiliconeMold dimensions: 8.57 x 6.34 in. (21.7 cm x 16.1 cm); cavities: 0.41 in. (1.04 cm) deepDishwasher safe; however for best results, wash in warm, soapy water before first and after each useMakes succulents in three sizes, two of each size per mold. Succulents measure approximately 1 inch in diameter, 1-1/2 inches in diameter and 2 inches in diameter Use with your favorite chocolate candy coating melts, gummy mix or other candy products.Easy release and clean-up. If you have any questions about this product by WILTON PRODUCTS, contact us by completing and submitting the form below. If you are looking for a specif part number, please include it with your message.